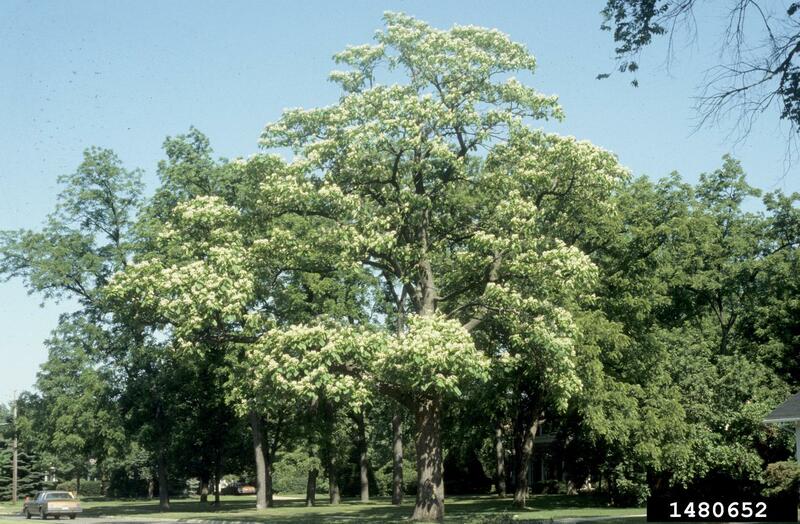 Our honored tree for August is the Catalpa tree, Catalpa speciosa. Commonly believed to be originally native to the river systems of the Midwest, it was found to be a very useful tree and its cultivation began in 1754. It is now naturalized from USDA Zones 4-7, from Indiana to Arkansas and east to the mid-Atlantic region south to Georgia. Ewing is in the USDA Hardiness Zone 6B. Catalpa (it is also commonly known as Cigar Tree, Western Catalpa, Hardy Catalpa and Catawba) can be identified by its coarse texture, its large, heart shaped leaves, its scaly, deep reddish-brown bark and its large seed pods. In the late spring when it is in flower, it can frequently be seen and quickly identified along roadsides because of its profuse, white flowering. Its coarse texture, abundant litter from the seed pods and flowers, and brittle wood make it undesirable for most residential properties but it is very useful in parks, campuses, large lawns and golf courses as an ornamental shade tree. The flowers, which last about two weeks in April to June, are arranged in pyramidal clusters of 10 to 30 flowers, bell-shaped and white with yellow and purple markings. They are very showy, with frilled or ruffled petals approximately 2” wide and long. This small-to-medium deciduous tree reaches heights of 30’to 60’ with a spread of 20’ to 40’. Some, under very favorable conditions, can reach 100’ in height. It grows rapidly and attains a ponderous, weeping look with its seed pods attached. It has a narrow, open, irregular crown and the lower trunk is upright and twisted. The Catalpa is the last tree to leaf out in the Spring.The new leaves are bright yellow-green and then they turn medium green. The underside of the leaf is fuzzy. The leaves are arranged opposite each other on the branch and the leaves are sometimes whorled in groups of three. The leaf size can reach 12” or more in length, with a width of 8”. The fall color is insignificant. The fruit is a bean-like pod which can be from 8” to 20” long with papery fringes at the ends. The pods persist on the tree into winter. Catalpa, like most trees, prefers a moist, well drained and fertile soil. However, it is very adaptable to almost any soil type, wet or dry, and is quite resistant to drought. It prefers full sun. The wood is soft and brittle; it resists rot when in contact with the ground, and for this reason it was used as railroad ties and fence posts for many years. The grain is very beautiful so the wood is now used for carving, furniture making and cabinetry. Catalpas have several diseases: powdery mildew, leaf spot, verticillium wilt and root rot among them. Its pests include midges and mealybugs, but the most interesting pest is the Catalpa Sphinx Moth, whose caterpillar, 3” long with “spectacular” greenish yellow and black markings and a prominent spine, often defoliate the tree. The caterpillars have been a favorite bait of fishermen for years, and often the tree has been grown for this reason alone.